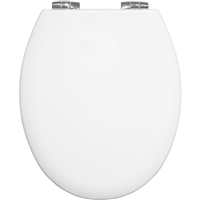 The Bemis White Buxton Stay Tight 2850CPT Toilet Seat comes with chrome hinges and Statite fastenings. The Bemis 4100CL New York Silentium soft close moulded wooden toilet seat comes with chrome hinges. The Bemis 4100CL New York Silentium soft close moulded wooden toilet seat comes with chrome hinges.